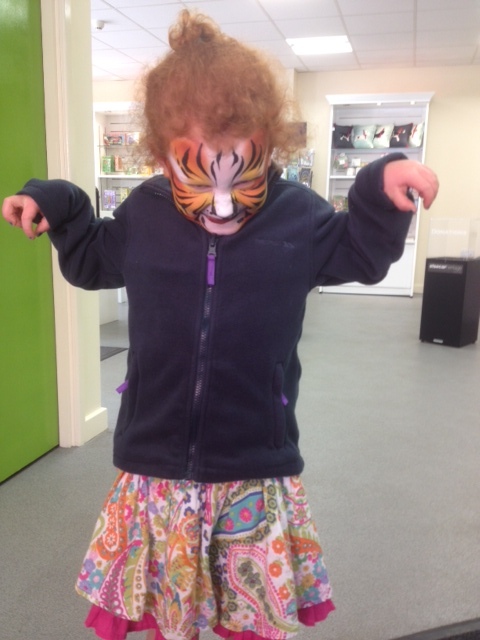 Tiger Tiger face painters have been all over the North West, painting faces, doing glitter tattoos and balloon modelling. Sat Aug 27th is the busiest day so far of the year. 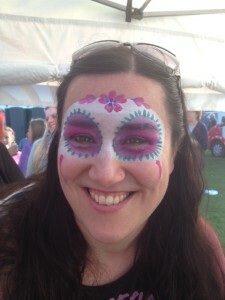 I have a painter covering a new Spar opening in the North East, painters working with me, doing painting and glitter tattoos at the Girl Guide festival and two painters covering the Burnley Canal Festival. So… busy, busy, busy! 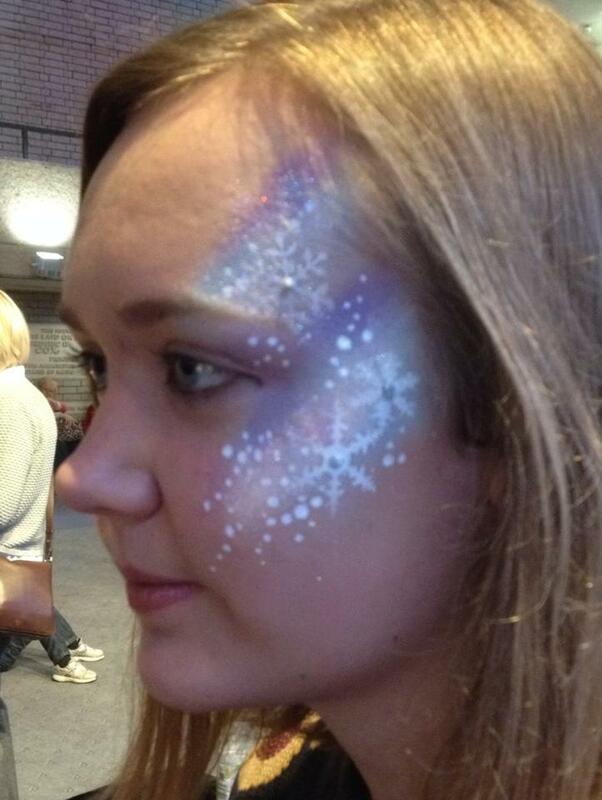 I had the pleasure of my son and his girlfriend working with me at the Halifax Fake Festival – a super busy day but they plunged in with gusto and thoroughly enjoyed themselves. The Glitter lips were a particularly popular request! I will be with my partner, painting and blinging up happy festival goers at the Fake Festival in North Hykeham. 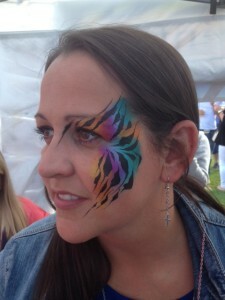 The festival face painting was a rip-roaring success last year so here’s hoping for another great day this Saturday. It’s October so Christmas is tinkling its way over snow-clad hills and sledging its way towards you which can only mean one thing – it’s time to get the sparkles out! 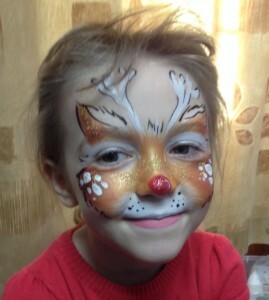 Book TigerTiger Face Painting t0 make your Christmas party or event extra specially sparkly. We are available for shopping centres, corporate parties, museums, stores etc, in all areas around the North West, ie, East Lancashire, West Yorkshire, Manchester and Leeds. 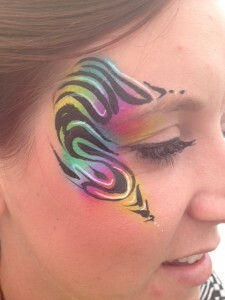 Here are just a few photos from what was a verrry busy day at Skipton’s Fake Festival. What’s a Fake Festival? I hear you ask. 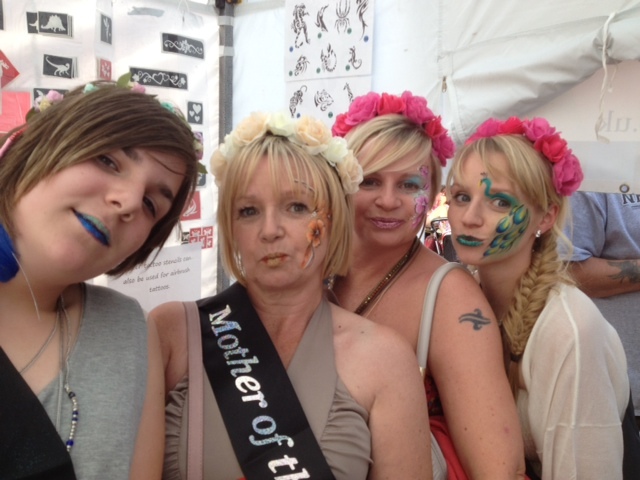 Is it a festival that is just pretending to be a festival? Nope. It’s a real festival with real bands, tribute bands to be precise. The Fake Festivals tour the UK bringing such tribute acts as Queen, Foo Fighters, The Jam, Oasis. 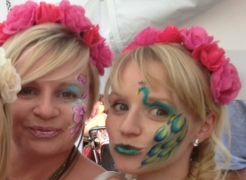 The Skipton Festival was packed with happy folks enjoying the sunshine and music and um, beer. As with any great festival it brought out everyone’s sense of fun and our gazebo was bursting at the seams with both adults and children all wanting face and body art. 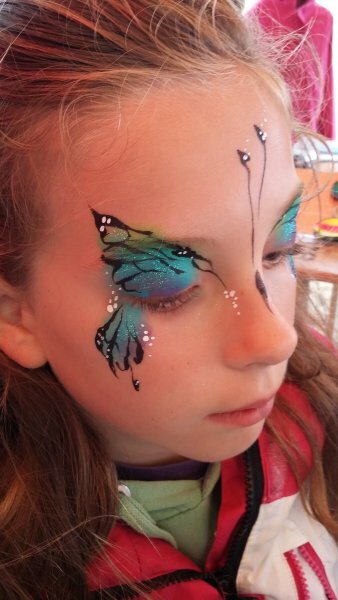 I painted about 20 zillion faces while my partner in crime did air brush tattoos, glitter tattoos, coloured hair extensions, crimp-in hair braids and glitter lips. 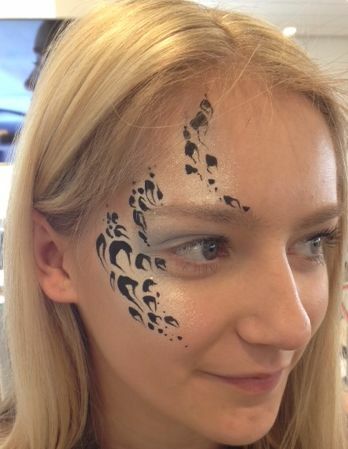 I painted Zoo Project style designs on the faces of some lovely folks at an adults’ birthday party in Ripon, Yorkshire, this weekend. 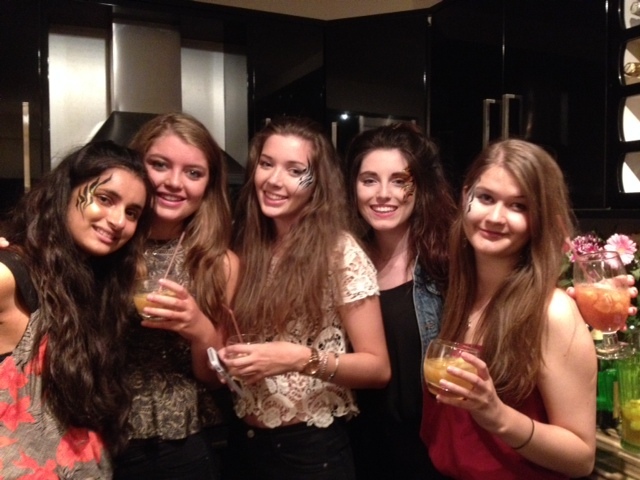 You can’t really see the face painting designs from the photo but I here it is anyway – some very happy party-goers. 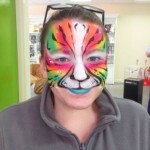 To book TigerTiger Face Painting for your adult themed party, give me a call on 07950 263964 or email tigerbuick@gmail.com. 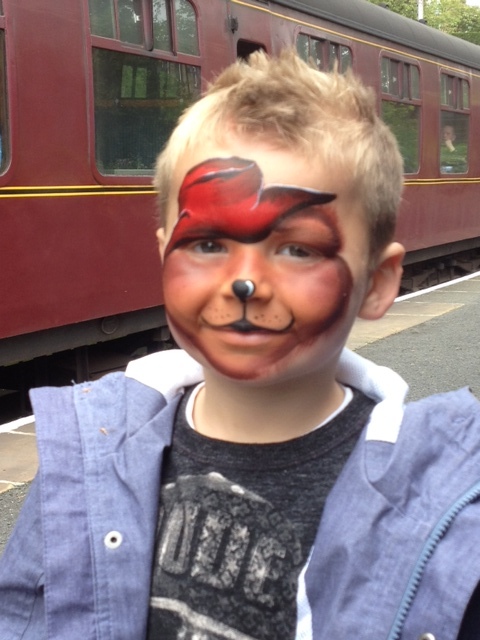 Face Painting for the Keighley and Worth Valley Railway. 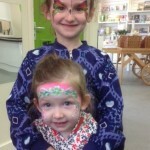 What a lovely location for face painting! 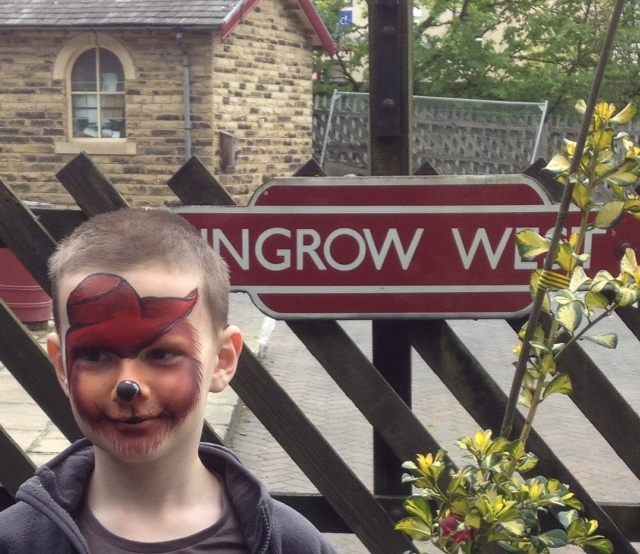 The Keighley and Worth Valley Railway booked me to paint faces for their Paddington Bear half term event. 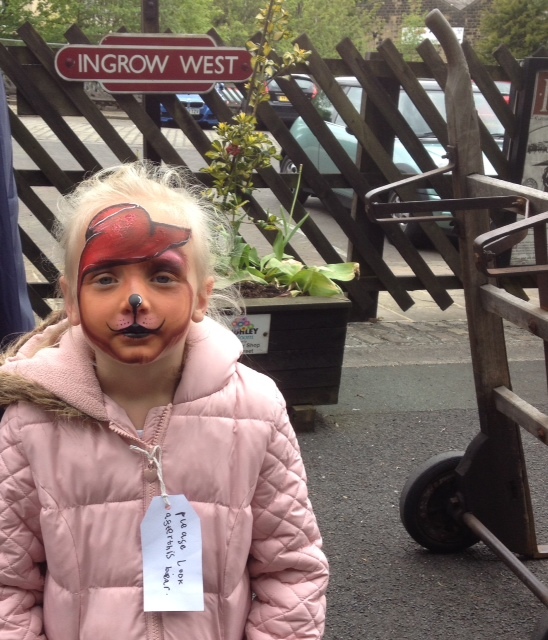 It was very well attended so the craft activities and face painting at Ingrow West Station was a hive of activity this week. 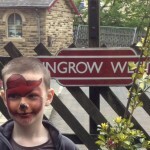 Even without the children’s activities, Ingrow Station is a great day out because it is truly idyllic. The gardens by the side of the track are meticulously manicured and the station boasts stacks of vintage suitcases, trunks and many other objects to take you back in time. Even the waiting room and toilets are truly vintage! 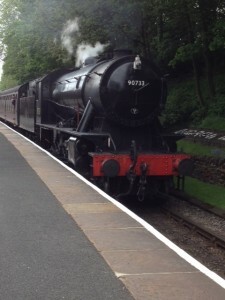 Not to mention the sight of the steam train roaring into the station – truly glorious. 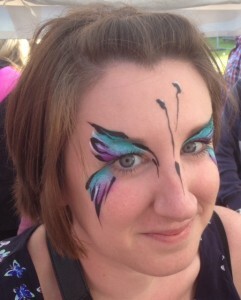 I have to say, Paddington Bear face painting was a bit of a challenge. In fact, painting Paddington’s red hat was far easier than trying to capture that furry face from Peru but it was all good fun and a great success. 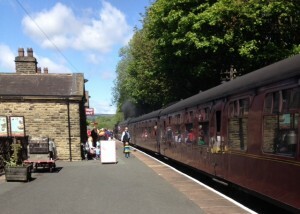 The steam train was fantastic and I can’t wait to get a day off to take a trip on this amazing railway which is almost entirely staffed by volunteers. 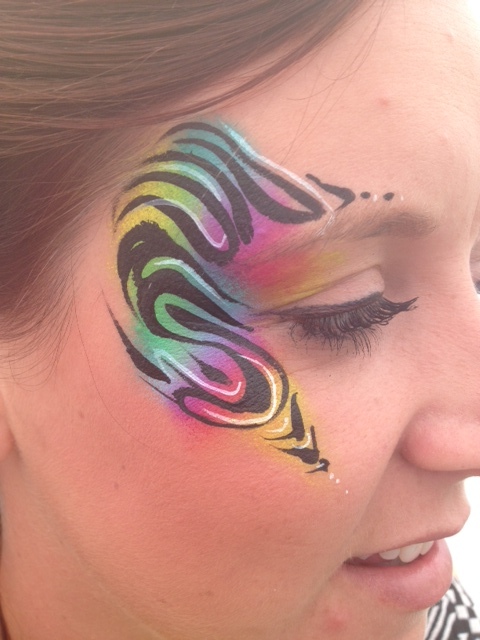 To book TigerTiger Face Painting for your event, call Stephanie on 07950 263964. 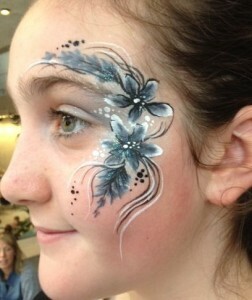 I had a lovely time painting faces at the Elsecar Heritage Centre in Barnsley this weekend. It’s an old colliery with beautiful old sand stone buildings, a steam railway and visitors’ centre. To tempt you further there are shops selling antiques and vintage style goodies. 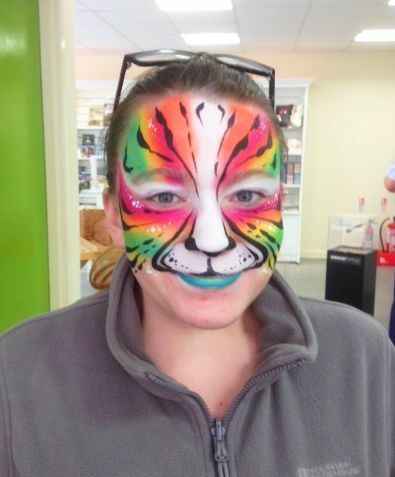 I love doing really bright face painting using uv colours so it was a delight to paint this lovely bright tiger face. 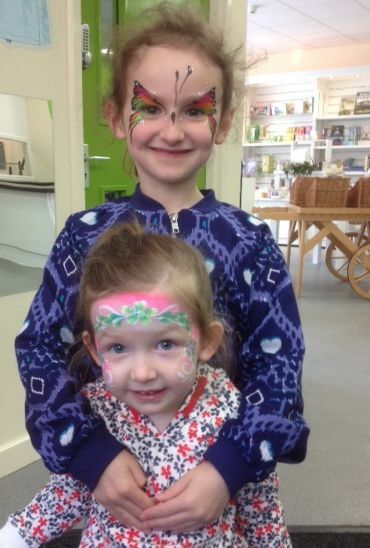 Despite the blustery weather the weekend was well attended with some exciting acts and performances and on the Sunday afternoon, visitors came in droves to get their little ones (and not so little ones!) transformed. This cute little cub went away feeling very tigerish. Then there was the boy who absolutely didn’t want to be painted. No way. 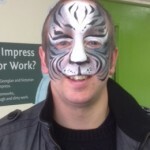 No, Dad was going to have his face painted instead! 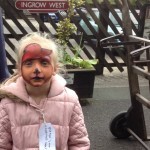 Luckily Dad was up for it – the things we do for our children, eh? 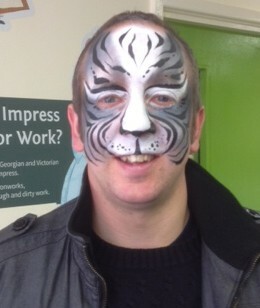 And here he is, in all his tigerish glory. 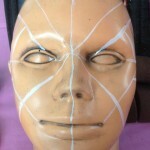 Nick Wolfe’s Face Painting Workshop – Monster Mathematics. 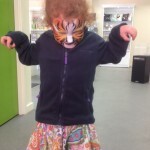 Monster Mathematics sounded like a cool and intriguing name for a workshop and let’s face it, while many of us find mathematics and monsters equally difficult to manage, to a face painter, monsters provide much more inspiration for face painting ideas than mathematics.